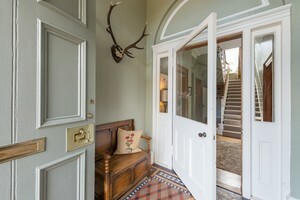 This is a magnificent large holiday home near Edinburgh, with easy travel into the city centre. 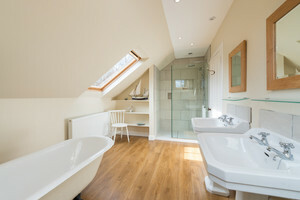 Stay in this 6 bedroom holiday rental property in Dalkeith that sleeps 11 (+3) with Wifi, Bath towels, Linen included. 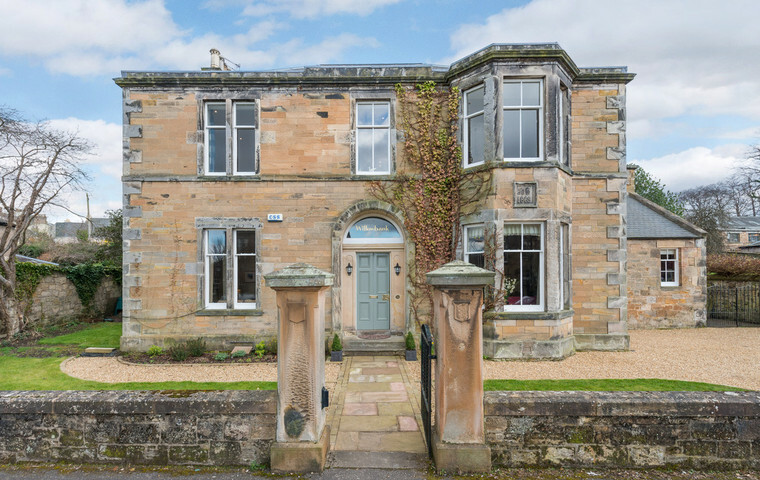 Willowbank is a large and spacious family home close to Edinburgh, with six bedrooms and four reception rooms. 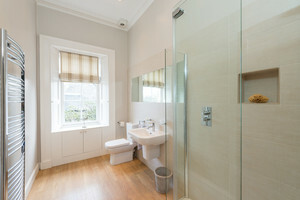 Located in Dalkeith on a very handsome street of period properties. 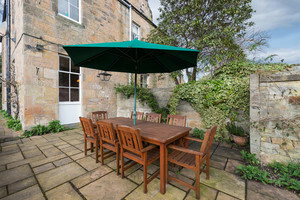 Dalkeith has great local amenities, various pubs and restaurants and lots of great family activities close by. It’s only a 25-minute bus ride into Edinburgh city centre. 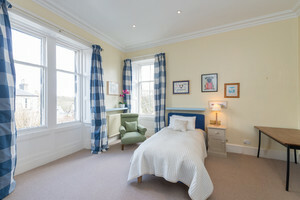 And around a 20 minute drive to East Lothian’s beautiful beaches and golf courses. 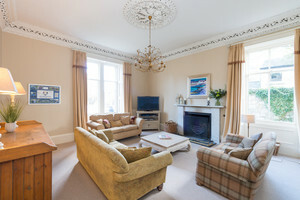 This large holiday home near Edinburgh has 3 king rooms, 1 double room with a double sofa bed, 1 twin room and 1 single room with an extra fold-out single bed. So, it would be perfect for families and groups of 11 to 14 people. 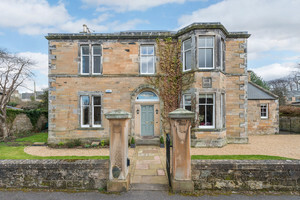 A large period property on Glebe Road in Dalkeith, near Edinburgh. 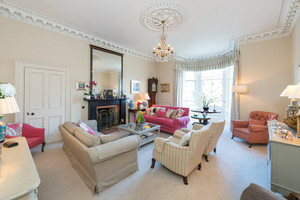 To the front of the house are two sitting rooms: a more formal drawing room opposite a comfortable sitting room. 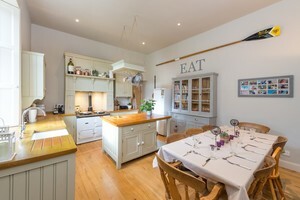 There is a lovely well-equipped dining kitchen with an Aga, a central island and a dining table with space for eight. 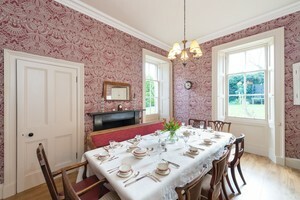 Larger groups can use the separate dining room, with a table to seat up to twelve. This room also has a hostess trolley provided for use. 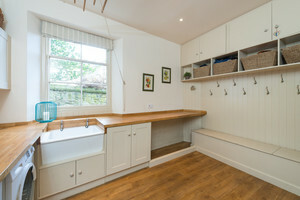 On this floor there is also a useful utility room and WC. 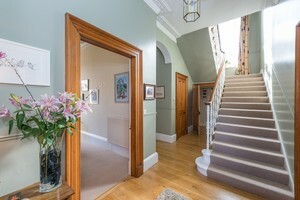 The grand hallway with curved staircase leads up to the first floor where there are four spacious bedrooms. 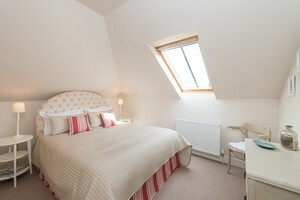 There’s a master bedroom with kingsize bed and ensuite shower room, a kingsize bedroom, a single bedroom with an additional fold-out single bed and a twin bedroom. 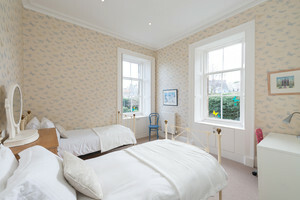 As expected with a period property, all of the bedrooms are extremely spacious. 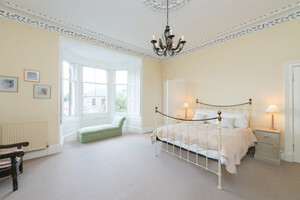 They have high ceilings, plenty of natural light and some wonderful original features. There is a family bathroom on this floor. You’ll find a further two bedrooms on the second floor. One has a double bed and a sofa, which can be made into a double bed. The other has a kingsize bed. 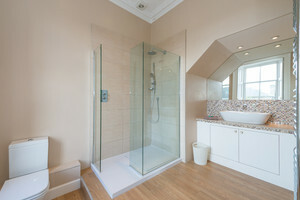 There’s also a spacious bathroom with roll top bath and separate shower cubicle on this floor. 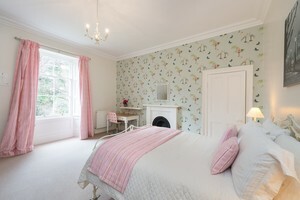 All bedrooms are simply but comfortably furnished. Outside, there’s a large enclosed garden, with a sheltered seating area perfect for outside entertaining during the summer months. 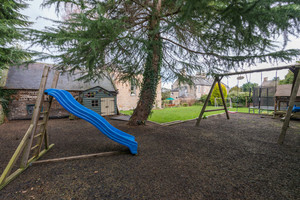 There is also a wonderful play area for children, with rubberised woodchip surface. It has a slide, swings, table tennis table and trampoline. Willowbank is a 20-minute drive from Edinburgh Airport, and Esbank Railway Station is just a 5-minute drive away. Parking notes Car parking is available at the house. 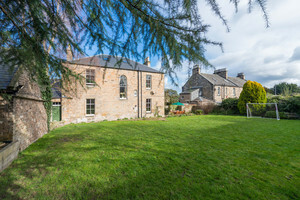 Local area Willowbank is located on the edge of Dalkeith, close to Edinburgh. Dalkeith town centre has all of the local amenities and various restaurants and award winning pubs including The Sun Inn. Dalkeith Country Park is a very popular park offering plenty of walking and cycling routes, and an adventure play area and cafe. very short drive: Vogrie Country Park, Pentland Hills, Hillend Dry Ski Slope and Tubing, Roslin Glen, Dobbies and Butterfly World, Fox Lake and Ryze trampolining centre. A 20 minute drive can also take you to the coast and the picturesque beaches, golf courses and driving ranges of the Lothians. For those who want to visit the major attractions such as Edinburgh Castle, or soak up the atmosphere at the Edinburgh Festivals, Edinburgh is just 25 minutes away, by car or bus. Beautiful property, quaint town with great restaurants. A wonderful way for the family to be together. The owners could not have been nicer and more accommodating! Thoroughly delightful! We arrived late afternoon with one additional question needed to access the house. Everything was ready for our arrival with fresh flowers at the entry and a bottle of bubbly to enjoy. Easy access to bus service into Edinburgh...local pubs and restaurants worked out great for our group. Easy access to a local grocer for breakfast items and all things needed for wine(or beer) and cheese at the end of the day. We enjoyed the many updates on this home; bathrooms clean and no problems with hot water for our group of nine; laundry access; the 6 bedrooms provided options for our group that worked out great; and we were able to enjoy the outdoor seating only one evening. Thank you. We absolutely loved our experience here. What a beautiful home- perfect for family holidays. A quick bus ride to Edinburgh but enough space for kids to run around in our down time. The host was generous with suggestions in advance, catered to our large family. Summer has arrived and we're seeing some beautiful sunny weather here in Edinburgh. So, let's go to the beach! Thinking of treating Mum to lunch this Mother's Day in Edinburgh (Sunday 31st March 2019)? There are lots of beautiful Edinburgh city walks. So peaceful and tranquil, you'd never know you were in the middle of the city!